Increasingly, customers are turning to cloud marketplaces to discover, trial, and buy cloud solutions. Software as a service (SaaS) apps are a core part of those customer needs. Azure Marketplace has long-offered SaaS apps for discovery and trial. At Build, we announced that SaaS apps can now be transacted within Azure Marketplace. You can discover SaaS services in both Azure marketplace as well as Azure portal. 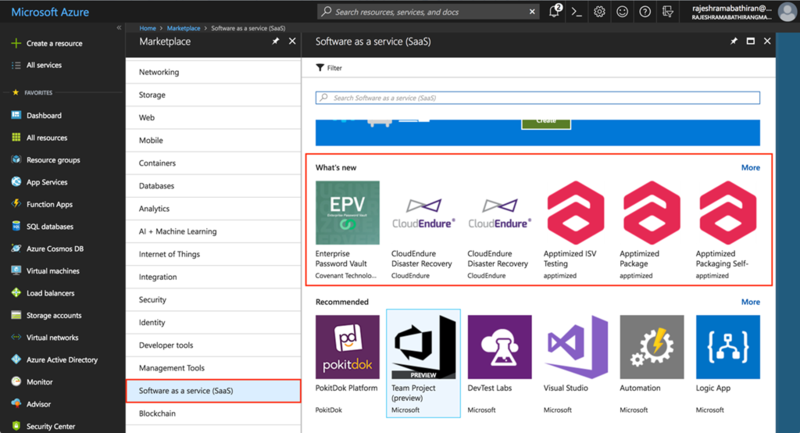 You can subscribe to a SaaS service in Azure portal. At the time of launch, the supported billing model is a flat monthly fee per subscription of the SaaS service. We are working on enabling additional business models in the future. You can use the new ‘Software as a service (SaaS)’ experience to discover and manage all your SaaS services. Pending – You have subscribed to the SaaS service in Azure. However, you have not started using the SaaS service yet. At this point, your monthly recurring payment has not started yet. Subscribed – You have subscribed to the SaaS service in Azure and started consuming the SaaS service. You will be charged the flat monthly fee every month, unless you delete your account in the SaaS service or delete your SaaS service in Azure portal. Unsubscribed – You have unsubscribed or deleted the account directly in the SaaS service. You will not be billed once you have unsubscribed from the SaaS service. Notify Azure whenever a user, who came to the SaaS service from Azure, signs up for a new account. Notify Azure whenever a registered user from Azure changes the plan (example: user moves from ‘basic’ plan to a ‘premium’ plan). Notify Azure whenever a registered user unsubscribes or deletes the account. Receive and act on notifications from Azure, if the user has unsubscribed from the SaaS service in Azure. Each of these actions is enabled via APIs in Azure marketplace. If you are interested in publishing your SaaS service in Azure, you can start your onboarding into Azure Marketplace.